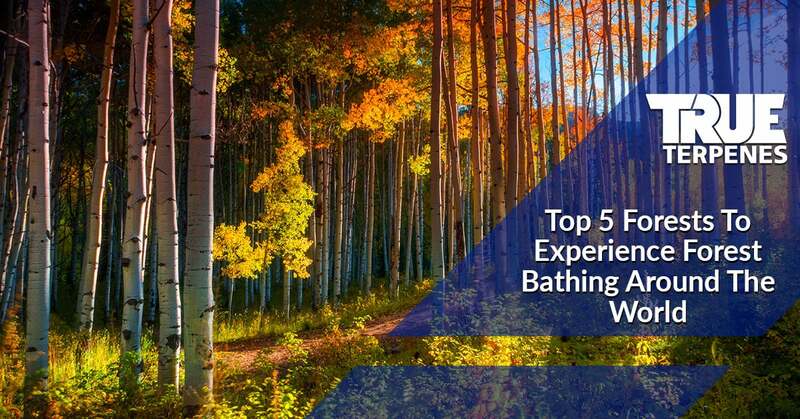 If you love to travel and you enjoy spending time in forests, you will want to read this list of the top five forests to visit for a unique forest bathing experience. What’s more, each of these forests have been shown to emit specific terpenes, which can add to the experience. Your forest bathing doesn’t have to be isolated to far away forests in other countries. You can enjoy the terpenes in these forests right at home, too. In this article, True Terpenes is going to share which terpenes exist in the top five forests around the world for forest bathing. If you’re apprehensive toward travel or simply want to enjoy the terpenes mentioned in this article, you can shop our terpenes for sale online now. Before we dive into the top five forests to visit, it’s important to understand how terpenes play a role in the experience. Terpenes are chemical compounds that plants and trees emit for a variety of reasons. When humans come into contact with these terpenes, we also, too, are affected. Our endocannabinoid system utilizes the terpenes in certain ways. For example, you may notice the potent smell of pine while walking through a forest. The aroma of pine occurs due to the chemical compound Alpha Pinene, a terpene. In some cases, Beta Pinene is also present. The South Korean region has a balmy subtropical climate. It also has an extensive spectrum of trees, too. A few of the most abundant tree species are the Japanese red pine, Korean pine, and Japanese larch. As visitors wander the shady groves, they will inevitably come into contact with the dominate terpene Alpha Pinene, as well as the second most prominent, Myrcene. Myrcene emits an earthy, musky aroma and is commonly sourced from hops. The flavor tends to be fruity or balsamic. At True Terpenes, the Myrcene isolate is a full spectrum and full flavor product that you can enjoy at home. Shop online now! Finland can rightfully be deemed the “forest kingdom” of the world. It’s a fairly large company with more than 70 percent of its surface covered in layer of forest. Indigenous trees coat much of the country, introducing to those lucky enough to explore, birch and pine trees. One of the most well-known trees in the forest is the silver birch (Betula Pendula). Within the chilly Finnish forests, two terpenes reign supreme: Camphene and Cineol (Eucalyptol). Limonene and Alpha Pinene can also be found in these Finnish forests. Do you want to enjoy Camphene while at home? Shop our terpene isolates for sale online now! Beyond the populous Mexico City, high in the elevated slopes, the Cumbres del Ajusco National Park exists. In the park, visitors will find expansive forests that attract extreme sports athletes and wilderness adventurers from around the globe. What’s more, the terpene Linalool is abundant in these forests, as well as Alpha Pinene. Linalool is also one of the most common terpenes found in household fragrances like soaps, shampoos, and detergents. It’s also found in perfumes and other fragrances in the beauty industry. Visit the Rocky Mountains in Colorado to find yourself immersed in a number of forests. The trees native to this region still attract visitors from all over the world. The Deciduous trees in this region alter their leaf colors as the season changes. For most, they enjoy watching the leaves go from green, to orange, to gold. However, the best time to enjoy these forests for the sake of terpenes is in the middle of summer. During this warm season, the trees emit the largest amount of the terpene Limonene. If you want to experience Limonene without traveling to Colorado, you can shop True Terpenes isolate online now! As another forest that touts Limonene as a dominant terpene, the Black Forest in Southern Germany is another region where you can experience high level of terpene emittance. This forest alone has captured the imaginations and minds of poets, writers, painters, other artists, and more. Those who are lucky enough to wander through it tend to never forget their time there. Discover the forests you would like to visit for your forest bath. Plan the trip. And then go practice Shinrin-yoku. Remember, the practice is about removing yourself from your modern life so that you can connect with nature, slow down your rhythm, and breathe deeply the benefits of forest bathing. If you’re unable to travel, you can experience the types of terpenes found in these forests in the comfort of your home. Shop terpene isolates for sale online now!